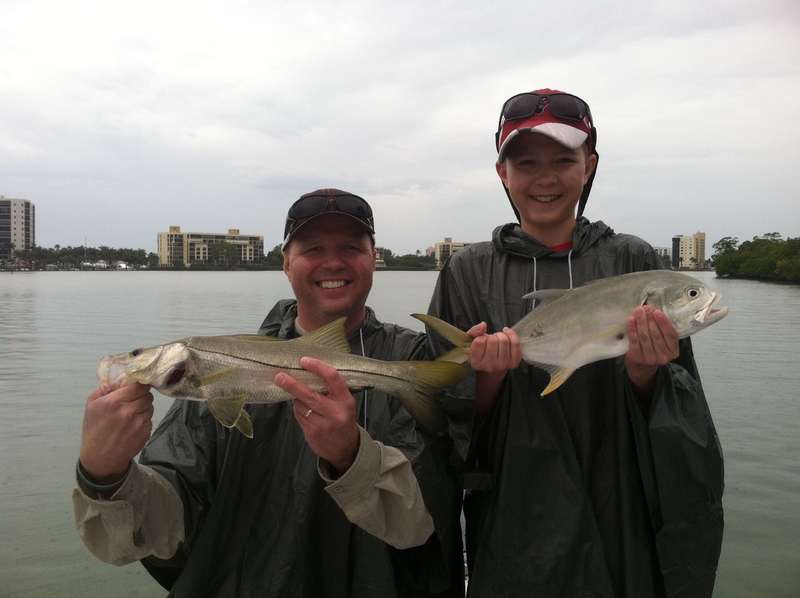 Fishing In Estero Bay and Fort Myers remains strong this week with a plethora of species you can target. If its Tarpon Sharks, and Mackerel you’re after than the near shore waters are best, start in about 10ft of water off the beaches and work out from there. Locate the schools of Thread fin herring that are out there and usually you will locate the fish. While you are out there use a Sabiki rig and get yourself a few baits for everything that’s out there. If its Redfish and Snook you are after than the inshore waters are where its at. They can be targeted best around the higher stages of the tides around mangroves and oysters. Use pin fish or Thread fin herring cut or alive for best results. There is a MASSIVE amount of TINY white bait or pilchards around, so small that you can’t use them for bait or net them. That being said if you’re using soft plastics and hard baits for lures go SMALL. This is often referred to as “Matching the hatch” where you use baits similar to what the fish are feeding on, simple idea but it will work wonders for you when trying to find fish. The fishing should remain goo through the rest of the week and in to next week so get out on the water and find some fish.